Anyone who has read my earlier posts will know I’ve been tracing the canal network in Google Earth and then adding information from a variety of sources. My idea is to create both a digital and paper compendium of canal navigation information. I don’t want “all our eggs in one basket” which is why I don’t solely want to rely on digital data. 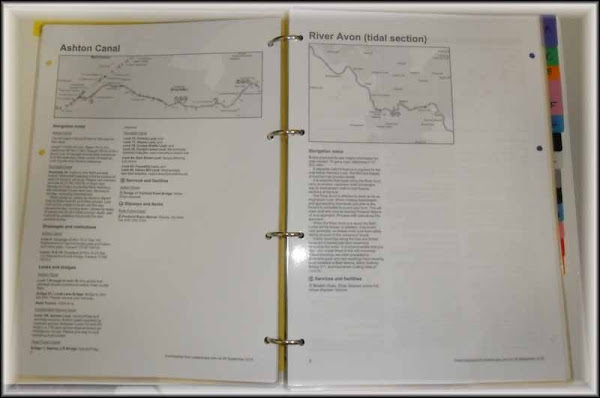 A trip to the local “Cheap as Chips” shop unearthed a $2 set of plastic dividers and we now have a reasonably weather resistant compendium of canal and river information. The major negative factor is the weight. If we are to keep within our checked luggage limit I think the folder will need to go in my cabin bag. You know they are now weighing cabin baggage as well. 7kg limit. You'd be surprised how many clothes I can wear and the size of the pockets are enormous. you do get canal map books, which have much better information than you have found from the internet, take a look at Nicholsons and even better J M Pearson & Sons canal companion guides, will tell you all about mileage, locks, bridges and numbers and everything you nee to know when cruising, you really are wasting your time and effort, on what you are doing and the weight on the plane! Yes, we have a small number of the Pearson guides and they are very useful. The BW information appears to include information such as phone numbers and timings which I think might be of use. I only have the weight problem as far as Hong Kong. From that point onwards our checked luggage allowance is 138kg. Still, if the weight does become critical the folder is on the shortlist to be discarded! We use canal planner on the laptop, linking water explorer via navvygator. Ususally is ok. I did try blogpress, but its positional accuracy is poor. however, we will continue to use this for its limited value. Very useful in planning, you can even view a fully photographed virtual journey once you have submitted your criteria. It will also be advantageous for you to sign up to the Waterscape automatic email notification of stoppages. There is nothing worse than being held up unexpectedly. Note to myself - I must have a look at Canal Planner.